What is Straight Grade Flour? 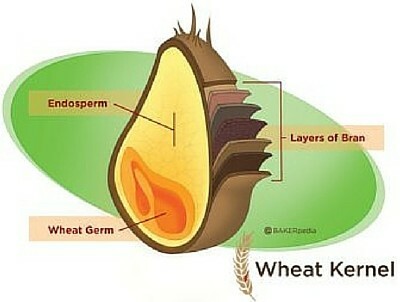 After wheat is milled, all the flour streams minus the bran and germ are used to compose straight grade flour. It is mainly milled from the endosperm of wheat, with some particles of bran and germ that cling too tightly to the endosperm and cannot be removed during milling. Straight grade flour is used to make patent and clear flour in the United States. Extra short or fancy patent flour contains 40 to 60 percent straight grade flour. It is made from soft wheat and it is used for cake flours. First patent flour contains 60 to 70 percent straight grade flour. It is also made from soft wheat and it is used for cake flours. 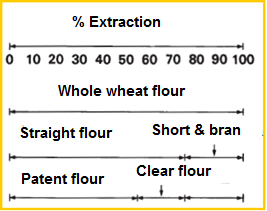 Short patent flour contains 70 to 80 percent straight grade flour. It is made from hard wheat. It is the most highly recommended commercially milled for bread baking. Medium patent flour contains 80 to 90 percent straight grade flour. It is also excellent for bread baking. 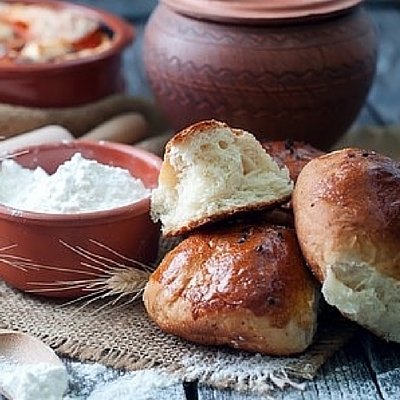 Long patent flour contains 90 to 95 percent straight grade flour and it is good for bread baking. Fancy clear flour is milled from soft wheat. It is used to make pastry flour. Second clear flour has a very high ash content and it is very dark. It is not generally used for food. Hoseney, R. Carl., and Jan A. Delcour. “Chapter 8: Dry Milling.” Principles of Cereal Science and Technology. St. Paul, MN, USA: American Association of Cereal Chemists, 2010. 129-30. Print. AACC International. “AACC International Approved Methods – Experimental Milling.” AACC International Approved Methods – Table of Contents. N.p., 2013. “Flour Grades.” CooksInfo.com. N.p., 12 Jan. 2010. USDA Agricultural Research Service. “Milling Formulas.” Milling Formulas: USDA ARS. N.p., 9 Sept. 2016.